a door knob ornament, or a wall hanging. 1. Thread 36 jingle bells onto the wire. close off the wreath. Use needle-nose pliers to twist the wire and secure the wreath. 3. Cut off any excess wire and tuck the twisted wire into the wreath. 4. Form a bow with the ribbon. 5. Separate three pieces of holly leaves and form the leaves into a circular display. 6. Glue the bow to one of the bells where the twisted ends meet. This will hide the twisted wire. 7. Glue the holly leaves on the bow and then the berries on the holly leaves. 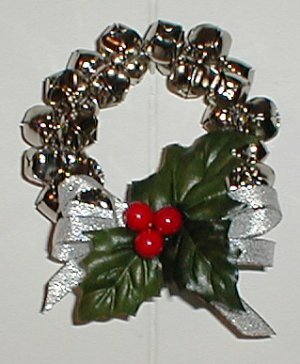 tie a small thin ribbon into the top of the wreath and form a loop for hanging.